When I built the Victorian wrought iron aviary from Pam Scott's book "The Garden Quarter", I didn't have any birds to put in it, so I tried sculpting my own parrots, and found that it was much easier than I'd expected. When others in the Little Enough News online group were looking for parrots I shared my method with the group, and later added this page to my website. First of all, search the web for parrot pics for reference. A pic of an entire parrot seen in profile will make sculpting a lot easier. Also, note that different varieties come in different sizes - from small parrots of about 30 cm (1 ft) to the 1 meter (40 inches) Hyacinth Macaw. 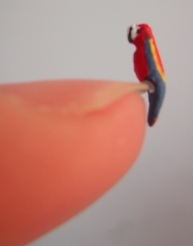 This means that a quarter scale parrot can be about 6 to 21 mm (1/4" to 13/16") long. You might want to start with the larger ones! Roll a little bit of paperclay to a thick sausage shape, then roll one end of it thinner (for the tail). The tail should be about 1/3 to 1/2 of the total length. Flatten the tail. Try to mark the neck at the front with a toothpick. Check the parrot's general posture, fuss with it if needed then leave it to dry. When your parrot has dried, check if you need to sand off any odd bumps. If you need to add more clay to some area, mix clay with a bit of water and apply little bits with a toothpick, smoothing out the edges. I also added a bump to the face, for the parrot's beak. Leave to dry again. If it still doesn't look good enough, keep sanding and/or touching up until you're happy. Now take out the reference pics again. Paint the parrot with waterbased paint, I used FolkArt paint mixed with a little bit of water to thin it. Don't try to paint it all at once - you have to hold on to something! When the paint has dried, use a black micron pen to add eyes and the black detail around the beak. 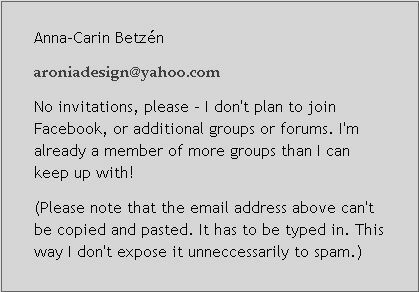 © Copyright Anna-Carin Betzén 2004. You're welcome to print the instructions or link to them, but do not copy them to repost elsewhere. This is a free project, not to be taught for profit.